I got an email from Molly who had a lot of questions about learning that your child needs glasses. I thought I’d turn to you for some answers. I think I speak for all of us, that our biggest fear when we learn our child needs glasses, is for their vision. But setting that aside, what was your biggest worry (if it’s not on this list, leave a comment? And once you’ve voted, I’d love to hear about how things turned out. Did your worries prove to be a problem , or were you surprised by something else? I did lose her glasses once, but Chris was able to find them in a neighbor’s yard. She did end up needing surgery. And to be honest, I think my biggest fear did happen, at least to some extent. She’s definitely known as the girl in glasses, and when she was younger, I think that her glasses were one of her defining features. And they still are, but I like to think now that she’s older, her personality is really shining through. She may be the girl in glasses, but she’s the girl in glasses who talks a mile a minute and laughs like crazy at her jokes and loves to bake and read stories. ← Speaking of patch pictures – #camopatchkids Sundays!! My biggest concern with Penny (aged 4) and her glasses is that she will lose her self confidence. She is currently quite confident, is willing to give most things a go and is generally a happy little girl. My fear is that her glasses will stop her doing the things that she loves, and so lose her confidence and personality. We picked her glasses up just and hour ago, so we’ll have to wait and see what happens. My biggest worry was that glasses would change my daughters appearance. She was 2.5yrs when she got her first glasses which initially she refused to wear but within a couple of months she actually looked more odd without glasses! A year on and I have worried about all of the above, the cost of repairing and replacing lost and broken glasses. Other peoples reactions to her wearing glasses. The fact she looks older in glasses and then when she starts school later this year will she be teased because of them or will she stand out too much, or just be known as the girl in glasses. That with poor vision my daughter would struggle to do thing that others take for granted. NanaNonna, I’m so glad you found us. Just know that your reaction is entirely normal. I also wear glasses for myopia and astigmatism. I love my glasses, I love wearing glasses, but I was really upset to learn that Zoe would need glasses. And I’ve heard from hundreds of parents that they had a similar reaction. No one wants their child to have vision issues, even if they are easily correctable. I think it’s good to acknowledge that we’re upset and worried, so that we can then set it aside and support our children in being able to see well. Well, the Little Man now has his glasses and has taken to wearing them like a duck to water! We have all got used to seeing him wearing them very quickly too and I’m finding that what’s upsetting us all now is that he spent so long not being able to see the world around him clearly … his concentration and fine motor skills have literally improved overnight – even though they weren’t a cause for concern before his diagnosis, his eyesight was obviously holding him back. He is having a few problems with them slipping when he’s being a bouncy toddler and with his 15 month old sister pulling them off. She is being ‘trained’ not to, but it’s a work in progress lol. I’ve ordered some ‘Speccles’ from Australia which should hopefully (along with the ‘Sister Programming’) help though. Wearing glasses is a GOOD thing! Your little one can SEE and they may even straighten out an eye turn. Kids adapt well. Parents and family should be sportive and VERY positive about the little one wearing glasses. This will make it easier for the child to wear the glasses. 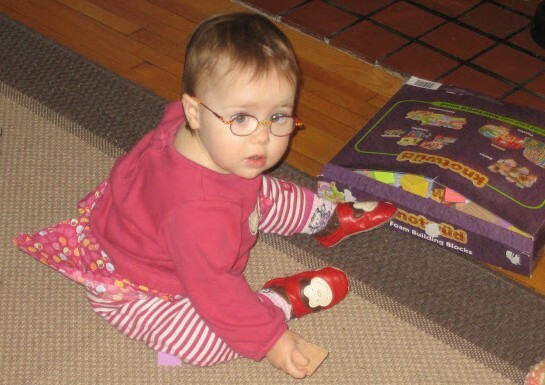 The first time we tried glasses was at 18 months and we let our fear about her not leaving them on get the better of us after just a short struggle to adjust (fogging and still not being able to see was also an issue). My 2nd biggest fear was that people would see only her glasses and not the rest of her. This could be related to the bullying and/or appearance issues. Yes, as the previous comment points out, glasses are a positive thing for their physical well-being but I think the issues most parents have with them are more financial (lost, broken, expensive) and/or about how the child will adapt emotionally (will they be stereotyped, bullied, not be seen for who they are?) Sometimes, people do see our daughter’s glasses first but most of the comments are positive and once they are in the room with her for more than a few minutes they start to see so much more about who she is and forget about the glasses almost altogether. I was worried something else, something major, was wrong because her eyes turned so badly. It couldn’t be anything less than a tumor – seriously. Luckily, I kept those fears to myself. Turns out, she needs bifocals for now. I can deal with that. My husband, however, had to patch and wear thick glasses in grade school. It was such a bad experience for him, being tormented, that he is worried our daughter will be bullied as well. She’s two and a half so there’s not much bullying going on and I figure all of her friends will know her as only wearing glasses. She’ll probably need glasses the rest of her life but in the grand scheme of things, it’s totally do-able. It did alter his appearance like I “worried” about. But the end result is that they are a part of him, as much as his green eyes and silly grin. He is wonderful just the way he is, glasses just happen to be part of that equation. My daughter is 3,5 and she got glasses about a year ago. First, I was scared for her eye health, I worried she might have an underlying cause for the vision problem (structure of the eye, etc. ), in connection with the myopia. Luckily that was not the case. Later, I was questioning if the dioptre was measured correctly. Then I worried what lens type to pick, what frame is the best. I worried about her self confidence as well. I was worried she falls and the glasses brake and hurt her face. Then I was worried she will be the only one with glasses in her kindergarden group, and she will be teased. It turns out, I should have not worried so much. She is the only kid in her group with glasses, but it does not make any difference there either. Kids love her, and they don’t care about her glasses at all. They don’t ask about, they don’t take it off, and she takes such a good care of them. If something happens to them, we have a spare and that made me feel much better. Nothing happened to her self confidence. I suspected her vision problem and had to “proove” she has, so I was releaved once she got the glasses. I still had to get used to seeing her in glasses of course. I read here long time ago, a mother commenting she grew to love her baby’s glasses, and I was wondering if that can happen. I am here to reinforce, yes, I love my little girl’s glasses! They help her see clear, assist her in learing to draw, play, etc. so they are useful, and I love them, because they are so cute on her! She has unilateral high myopia, one eye with high myopia, so it was important to find high index materials, so the lenses look similar to each other. I have cosmetics of the lenses to worry about too when it comes to getting new glasses. She has transitions lenses, protecting her eyes, and they look so cool, people just love it. Amy you are and awesome mom! The information and experiences here have helped me a lot! We just took my now seven month old to the po last month for concern that his left eye seemed to be pulling in still. I guess his eyes are in the normal perscription range but the left one is weaker and has a stronger perscription than the other. Though she couldnt get it to turn in while we were there because of the difference in vision we go back to be rechecked in a month. I feel like i was just left hanging and have no idea how bad the discrempensy is and what the treatment would be if there is one i wish i new. It’s always so hard not knowing. It’s good you are keeping an eye on it and going back. If you catch your son crossing his eyes, you can try to get pictures (straight on, with flash is best – I had luck getting pictures of my daughter while she ate in a high chair). Then you can take the pictures to the appointment so the po sees what you’re seeing even if he won’t cross his eyes at the appointment.